Whatever started out as just a hobby has now brought this airman one step closer to Hollywood. Capt. 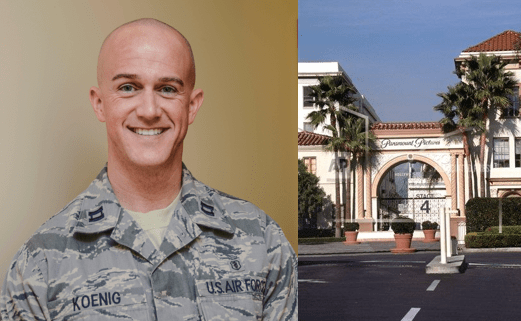 Eric Koenig, the 412th Aerospace Medicine Squadron dental flight commander, recently accepted an offer from Paramount Pictures to purchase one of the many scripts he’s written in the last three years, according to a news release. Capt. Eric Koenig accepted an offer from Paramount Pictures to purchase one of his screenplays, “Matriarch,” on Veterans Day. (Photo of Koenig by Rebecca Amber/Air Force; Paramount Pictures via The Associated Press). The screenplay sold for an amount in the mid six-figure range, the release said. The plot follows a female serial killer on death row and her prison psychologist. There is one undisclosed piece of information left that would reveal the location of the killer’s final victim. The psychologist finds herself working to find that information prior to her patient’s impending execution. Koenig, in the military 13 years, said that he enjoys and often works on films with darker themes. The week before his screenplay was bought, “Matriarch” was entered in a Launch Pad contest on a Hollywood insider information website. His piece made it into the top 25, attracting the attention of a marketing team made up of a manager, an agent and an entertainment lawyer, according to 412th Test Wing public affairs writer Rebecca Amber. While the purchase doesn’t guarantee a big screen debut, Koenig said he wants others to consider turning their hobbies into dreams — if that’s where life leads them. Without any formal training, Koenig learned to write screenplays by reading books on the subject.